Your licence has information about you, which vehicles you can drive and the conditions you must follow while driving. height (not after 1 October 2016). The class on your licence shows the types of vehicle you are allowed to drive. Your licence will show the highest class you can drive—you may drive any vehicles in the lower classes. But, if your licence shows a condition code you must comply with the condition at all times when driving any motor vehicle. is built or fitted to carry no more than 12 adults, including the driver. A specially constructed vehicle with or without a trailer. Note: A specially constructed vehicle may not be driven on a class C learner licence. A bus or truck (including a prime mover or a mobile crane) not more than 8t GVM. Note: You may also tow a trailer with a maximum weight of 9t GVM. Motorcycle licence classes are listed separately on your licence. is included on our learner approved motorcycle list. to the seating capacity of the motorcycle. Either of these modifications must be approved under the Vehicle Standards and Safety Regulation. Modifications that increase the maximum engine power of the motorcycle are not considered allowable. A motorcycle (2 or 3 wheel) with unlimited engine size, with or without a trailer. The specially constructed vehicle licence class, class UD, may be listed separately on your licence. However, the class UD is no longer issued to new applicants—specially constructed vehicles may be driven under the authority of a class C provisional, probationary or open licence. Mobile cranes over 4.5t GVM cannot be driven on a class C licence—you will need the appropriate class of heavy vehicle licence to drive a mobile crane. any other motor vehicle that is not constructed to carry passengers or a load, except things used in performing the vehicle's function. This class does not include a motor vehicle with a chassis that is substantially the same as a truck chassis, or a motorcycle. Note: A person must not carry out high risk work unless they hold a licence for that class of work. A high risk work licence may be needed to operate mobile machinery such as cranes, hoists or forklifts. Find out more about high risk work licences. Your marine licence will be shown on the back of your driver licence. 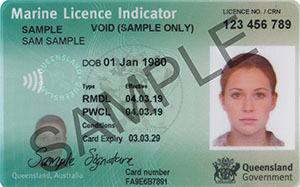 A separate blue marine licence indicator card will only be given to you if you don’t have a Queensland driver licence. Your marine licence will show if conditions apply. ‘Y’ = Yes. This means that conditions apply to your marine licence which you must comply with. You should have been given a letter stating the applicable conditions. If you are unsure, you can call the Department of Transport and Main Roads on 13 23 80 or visit a transport and motoring customer service centre. Your marine licence conditions are different to your driver licence conditions. ‘N’ = No. This means that there are no conditions that apply to your marine licence. Find out how to get a marine licence. Your licence type affects when and how you can drive. 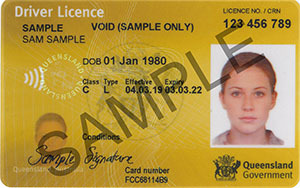 Your licence type is shown on your licence as a licence code. You must obey any condition codes listed on your licence at all times while driving. A You may only drive a motor vehicle with an automatic transmission. B You may only drive a motor vehicle with a synchromesh gearbox. I If you are convicted of a high-risk drink driving offence you will be subject to an alcohol ignition interlock program on completion of your disqualification period. You may only drive a nominated vehicle fitted with a prescribed interlock, or with an exemption certificate given under section 91R(3) of the Transport Operations (Road Use Management) Act 1995. You must comply with any conditions that are mentioned on the exemption certificate. You may only drive while carrying a current medical certificate form (F3712). You must obey any conditions listed on the certificate. RD You may only learn to drive a class of motor vehicle stated on your Returning Driver Certificate. You also must carry this certificate with you while learning to drive. You may only drive while wearing corrective lenses. You may only drive a motor vehicle that has been adapted or fitted with driver aids in order to obey a written notice given to you by the Department of Transport and Main Roads. You must have this notice with you while driving. You may only drive while carrying an order under section 87 or 88 of the Transport Operations (Road Use Management) Act 1995. You must follow the conditions in the order. You may only drive while carrying a special hardship order and any special hardship variation order. You must obey any conditions in the order. You may only drive while carrying an order under section 79E of the Transport Operations (Road Use Management) Act 1995 and any section 79E variation order. You must follow the conditions in the order. If you have an automatic (A) condition on your licence you must not drive a manual transmission vehicle. display L plates on the vehicle while learning. If you want to remove the A condition from your licence, you will need to pass a practical driving test in a manual transmission vehicle.